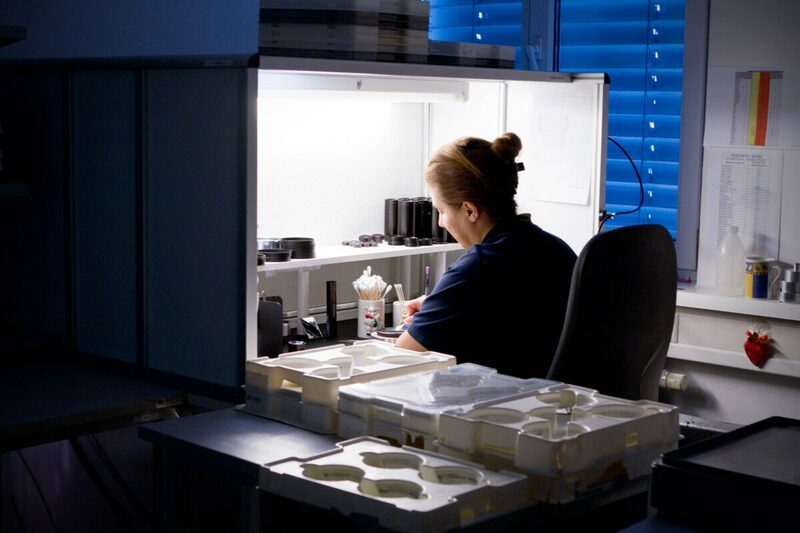 Parts for small-batches, prototypes and zero-series are manufactured at In-Vision while parts for larger batches are often manufactured by In-Vision certified suppliers. In any case, for any final product that leaves our house, assembly and testing are done at In-Vision headquarters by our team. We have an optical lens and a light engine assembly group. For both departmens prototype assembly, RMA-handling and assembly of serial products are strictly separated from each other to ensure process stability. Our team meets every morning for a stand-up meeting to discuss the state of individual products, electronic Kanban-Boards are spread out in the assembly department to have a constant overview on products being processed. Before assembly, all parts undergo incomming quality inspection before they are brought to assembly. In assembly, we work with flow boxes for most sub-components and even with clean-room assembly for highly critical sub-components.